Sorry I'm running late this week. I had to help my oldest daughter take care of some personal issues and I'm beat from running the Magic 2013 Prerelease. So beat in fact, I cancelled Mightiest on Monday. 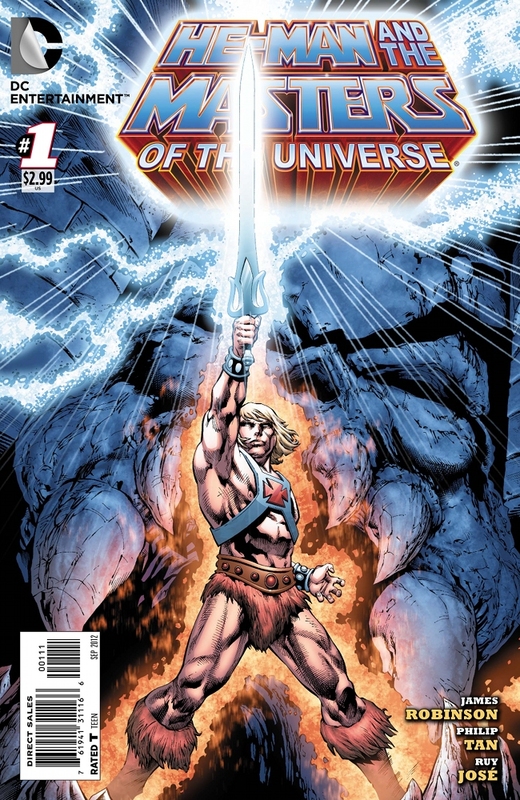 This week's special Masters of the Universe Monday, now with more Wednesday focuses on DC Comic's new He-Man and the Masters of the Universe series that debuted last wednesday. It's written by James Robinson (Starman, Golden Age) with art by Philip Tan and Ruy Jose. Full disclosure here, James Robinson left comics to work in Hollywood and then came back to the industry a few years ago. I don't think his work is nearly as strong as it used to be and I'm sad to say that's apparent in this book. That being said, I think it's great that a writer who has written at his level took on He-Man and the MotU cast and really give him props for that. I'm not sure how surprising the story is, but I'm going to stick with it and my 11 year old son loved it.